Children learn by imitating what they see grownups do or say. There are some skills however that they learn even without them realizing it. These skills still count later on in life so every loving parent should encourage their kids if they are interested. Cooking is a skill on its own. It however helps kids with various other skills and can even extend into classrooms. Hopefully parents feel motivated enough to let the young tykes be their little helpers in the kitchen more often. So what can kids learn in the kitchen? 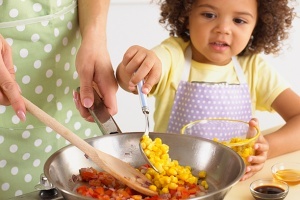 Cooking provides wonderful opportunities to help your child learn mathematical vocabulary. How better to learn phrases like ‘more than’ or ‘less than’ than by weighing out ingredients. Remember in the UK to weigh in grams rather than imperial measures. Let your child feel a 1kg bag of sugar to feel how heavy it is. He or she could also feel other packages to help to develop estimation skills. Your child will gain experience in counting and recognising numbers. If decorations are to be added to cakes, let your child add a specific number and counting opportunities can arise while setting the table. Through the use of different cutters, children can learn the names of various 2D shapes. You can discuss how many corners or sides these shapes have so that children will learn the properties of many shapes. Your child can learn about timing too. Instead of putting your child through long winded explanations and counting exercises, why not let them have fun while learning math? Math can be one of those tough to grasp concepts that has its toll even on the brightest of kids. There is already a notion even among teachers that mathematics is harder than other subjects. By incorporating it into cooking you eliminate this notion both from yourself and the child helping. They will learn to think of it as a normal part of life rather that a problem they have to deal with much like they view food. You can help your child to learn lots of new words and concepts through discussion while you are cooking. Show your child what a recipe is and that you need to follow instructions in order to achieve the required result. Children can learn the names of ingredients and words like sieve, whisk, stir, mix, roll and melt. They can look for words on packets like eggs and sugar and try to find these words in the recipe. Take a look at our easy recipes that your kids will love to eat and help you make. Rather than tell your child everything about a recipe, leave space for them to discover for themselves. Do not a hurry up on reading out new words in recipes but rather let the child struggle for a bit. This will push them to learn more words. Take the time to go over the ingredients and make a conversation out of it. Instead of having to ask the child to put certain words in a sentence, by having it as part of the conversation, you find that they do that all on their own. Remember to praise them when they pronounce a new word right or even make proper use of a new word. Small wins in the kitchen will translate into bigger ones in the classroom and in everyday life. It is surprising just how big a part science plays in cooking. It involves the concept of changing materials: liquid cake mix becomes a solid through baking, juice can become ice lollies when frozen and chocolate melts when heated. Cooking provides an excellent opportunity to discuss where foods come from such as eggs or milk and how and where various foods grow. Children can learn many things through questions raised in the kitchen including what they need to eat to keep healthy. Talk to them about which foods give them the energy to run and jump and which ones help them to grow strong. Or see science in the kitchen whist making a pizza base from scratch Pepperoni Pizza is a firm favourite to make. Remember to avoid getting complicated all of a sudden. Cooking should essentially be simple and fun. If you aim to teach a complicated theory to your child, build up slowly and carefully to the lesson. Complex scientific theories will sound a lot more friendly and easy to understand. This is especially given to the fact that the kitchen is a relaxed environment and the kid does not feel that they will be examined later. It is important to let your child to carry out as many of the cooking tasks as possible (excluding dangerous ones where sharp knives are involved). Obviously if there is a lot of mixing they could begin and you could finish it off as they may lack the physical ability. Tasks such as holding a spoon, mixing, beating, shaking, pouring, rolling or cutting will help to develop your child’s fine motor skills whilst encouraging your child to smell and feel the ingredients will help to improve his or her use of senses. Our Rainbow Pancakes are perfect for little ones to make and they score some major cool mum (or dad) points too! Having you child help will also give them a much needed boost of self esteem. They will feel important and this will help them cope socially. Children also want to feel needed and asking for their help makes them feel this. Food is a really good vehicle for communication. Children can learn to share and how to take turns, particularly if they make something with a friend or sibling. Then when the cooking is over, you can sit down and enjoy eating together. Children have short attention spans so give them quick, simple jobs. Cooking is clearly a good way to teach kids some important lessons. It also helps them learn good habbits that they can then apply in life. The best educational games for kids: OUTDOORS!